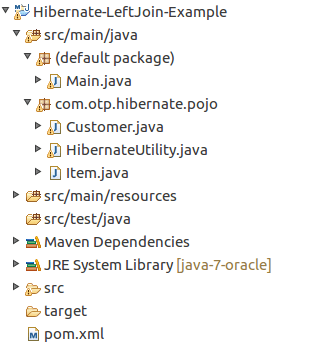 In this tutorial, I am going to show you how to work with Hibernate Left Join. The Left Join is a keyword in SQL, which returns all data from the left-hand side table and matching records from the right-hand side table. We can see the NULL values from the right side if there is no match. We can apply the Joins in Hibernate by using the HQL query or native SQL query. To make a join between the two tables, the two tables must be in a logical relationship. We can achieve the relationship between two tables by applying the parent table’s primary key as a child table’s foreign key. For this tutorial, I am going to take the two tables like Customer and Items; these two are having one to many relationship. That means one Customer can have multiple Items. Create customer and item tables with data to apply left join. Query For Hibernate Left Join on the above tables, the same will be implemented in below class as hql select query. Query qry= session.createQuery("select c.customerName, c.customerCity, i.itemName,i.price from Customer c "